A harsh thought, but a common one on the minds of young women, according to a survey by The Women’s Channel at AOL. The survey found that out of 45,000 women surveyed, over 60 percent claimed that they hated the way they looked. Amanda Wheelock, a nineteen year old freshman in college, is no stranger to negative thoughts when it comes to body image. Wheelock has had problems with negative body image for at least six years now. She remembers first developing an unhealthy mindset when she began junior high, a crucial time in the development of a young woman’s sense of self. “It started in middle school, right around when my body and my worldview of what a body should be was being shaped,” Wheelock said. A survey conducted by Linda Smolak for the International Journal of Eating Disorders showed that 40-60% of girls aged 6-12 are concerned about “becoming too fat”. Why do these problems arise? What spurs such negative modes of thinking? Dr. Eric Stice, an award-winning contributor to eating disorder research, found that body dissatisfaction is the leading catalyst for developing disordered eating. All too often, women forget that each and every body is different than the next. Even identical twins can have bodies that differ in appearance. No one person looks exactly like another. Yet through mainstream media, women are convinced into believing that they can achieve the “model thin” look. What they aren’t being told is: they can’t. According to a study by the West Virginia Department of Education, the average US woman is 5’4” tall, and weighs around 145 pounds. The average American model is 5’11” tall, and weighs 115 pounds or less. An average height woman who weighs 115 pounds will still look nothing like the 5’11 model who weighs the same. Image retouching and manipulation are additional factors that contribute to the gap between what is actually attainable and what is perceived to be attainable. Even when all of this is taken into consideration, the fact that eating disorders are extremely prevalent among models is something passed off as “part of the industry”. A survey conducted by the Model Alliance, an organization dedicated to giving voices to the faces of fashion, found that out of the 85 models interviewed, sixty five percent had been asked to lose weight by an agency. The survey also found that half of the 85 had participated in fasts, cleanses, or otherwise restrictive diets to do so. Anne Becker, an associate professor of anthropology and psychiatry at Harvard Medical School, explored the media’s impact on young women by interviewing Fijian girls just three years after television had been introduced to the island in 1998. 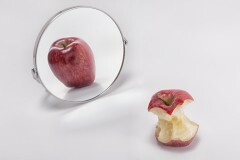 Becker’s research showed that eating disorders and negative thoughts on personal body image were alive and well on an island that had not previously known anorexia nervosa or bulimia just five years before the introduction of television. The young girls interviewed saw thin women in commercials and on soap operas, then looked at their own bodies with disdain. Nichole Wood, a psychologist at the Laureate Eating Disorders Program in Tulsa, Oklahoma, spoke on the impact that media has on women. “There are only so many times you can be hit with the message that your body isn’t right—whether you see it on TV, hear it from your mom or just feel it in the ether—before you internalize it and start beating yourself up for not being as perfect as you should be,” Wood said. A 2008 survey by the University of North Carolina at Chapel Hill found that 75 percent of American women have had unhealthy or disordered thoughts, feelings, or behaviors in relation to food or their bodies. This means that 3 out of 4 American women have skipped meals, purged, or fasted in order to lose weight, or have otherwise had unhealthy behaviors towards food. Cynthia R. Bulik, director of the UNC Eating Disorders Program and a Professor of Eating Disorders in the UNC School of Medicine’s department of psychiatry, played a major role in the analysis of the survey data. The data shows that chances are, if you are a woman reading this article, you have likely had disordered eating habits and/or negative thoughts regarding your body. Men aren’t excluded from the body image problem, though. The National Eating Disorder Association (NEDA) estimates that 10 million men will suffer from a clinically significant eating disorder at some point in their life. The standard for the male body in American media is tall, lean and muscular, which is largely unattainable for most men. These images lead to male body dissatisfaction, which can spur eating disorders and excessive work out routines. An AOL body image survey found that among college-aged men, nearly 70 percent believe they do not have enough muscle. In recent years, male bodybuilders have become prone to muscle dysmorphia, an emerging disorder that causes individuals affected to become obsessed with being adequately muscular. Spending hours on end working out, spending copious amounts of money on protein powders, shake mixes, and supplements, and having abnormal eating patterns are parts of the disorder that many men do not recognize as being unhealthy. The National Association of Anorexia Nervosa and Associated Disorders says that men are less likely to seek treatment for eating disorders because of the perception that they are women’s diseases. Many men suffer from body and muscle dysmorphia, but feel like they cannot discuss it without seeming “weak”. These statistics are frightening on their own, but even more so when the fact that they are increasing is taken into consideration. The National Eating Disorders Collaboration group found that eating disorders are increasing in both younger and older age groups, as well as amongst boys and men. This means that both men and women of every age, socioeconomic status, and ethnic background are being affected by the societal “body norms” portrayed by the media. Because many men and women do not even realize they have disordered eating habits, education and awareness are vital aspects when it comes to reducing the prevalence. Wheelock has been working towards a positive self image to combat the pressures of looking a certain way, and has recently come up with a few solutions of her own to quell inner criticisms that may help someone who is also struggling with disordered eating. One of the ways she comes to terms with natural body weight fluctuation is thinking about animals and how they also experience fluctuations in weight. “For lots of animals, fluctuations in body weight is expected. I think about how humans are also animals, and how fluctuations in body weight often are completely natural and healthy,” Wheelock said. Losing or gaining weight in summer months, when you are sick, stressed, or on your period are all natural phenomenons. Wheelock found that when she focused on those facts, she was able to realize that the normal changes her body went through were not flaws. “When I started to look at my body as a natural vessel, just like any other animal’s body, trying to keep me healthy, I became more content with the changes and fluctuations occurring,” Wheelock said. In addition to focusing on positive aspects of her body’s processes, she decided to filter the media she was being exposed to. In order to have a more positive intake of media, she followed a number of plus sized models on their personal social media accounts. “When I see them, I’m reminded that beauty has nothing to do with weight. Their weight isn’t a flaw,” Wheelock said. For those with an eating disorder seeking help, the resources are ready and waiting. Eatingdisorderhope.com can help you find resources and clinics near you, where further assistance can be provided. If you are seeking understanding, the NEDA has a toll free, confidential hotline that provides support from volunteers, that can be reached at 1-800-931-2237.